Since she was young, Maria's dream has been to have a place with lots of flowers. Asking herself to make the dream come true she figured out that the solution was to make a garden for herself and others. I had the chance to interview with Maria and Oscar, students at Paul International High School about why the students decided to renovate and plant the raised beds located on their school's blacktop. They both agreed to it, and these are the questions I asked and the answers I found. Soukeina: What inspired the students to make a garden? Maria and Oscar: The students said they wanted to eat more healthy, natural foods and maybe let other people have the opportunity to eat healthy so we are not the only ones benefiting from the garden. The other thing they said was that their inspiration is to have a place that is beautiful, good-looking, smelling of flowers, where you can hang out with your friends and do other things. Soukeina: Was this garden your first garden? Maria and Oscar: Yes, it was our first garden. Soukeina: What did this garden change in your life or the lives of others? Maria and Oscar: The garden has had a positive impact in the life of some young people in their neighborhood. Instead of going out and doing bad, they spend that time in the gardens. Soukeina: What are your best memories in the garden? Maria and Oscar: We have a lot memories of the garden. One of the best memories is when we helped plant the first and only tree in the garden. Now there are many trees surrounding the garden. Soukeina: Were you helped by volunteers when you began the garden? Maria and Oscar: Yes, we were helped by volunteers, mostly the children who want to know more about gardening. Soukeina: How did the volunteer help the students? Maria and Oscar: The volunteers helped design the garden and plant the seeds. Soukeina: What are the difficulties you had or have in the garden? Maria and Oscar: The difficulty in the beginning is money to buy the materials, to get people interested in the garden. It's also difficult to remove all of the weeds. -Soukeina T., student at Paul International High School in Washington, D.C., May 2014. 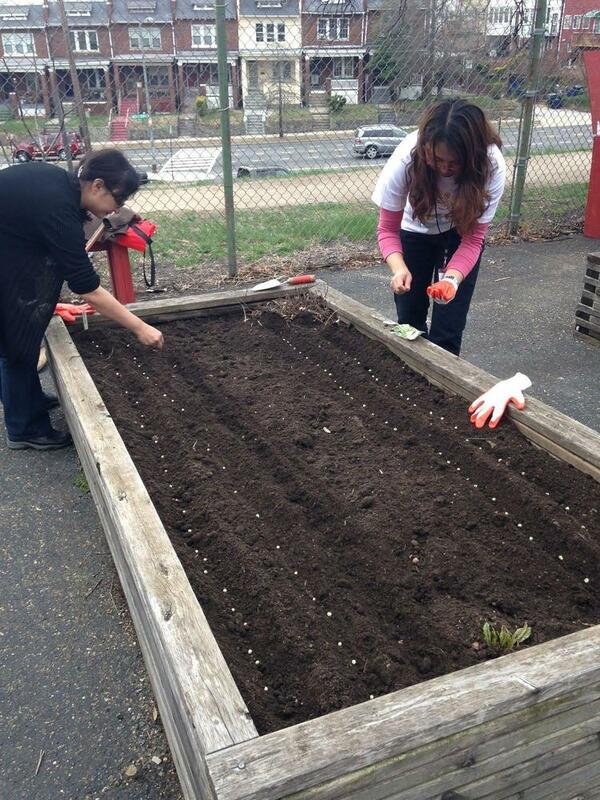 Students, staff, and volunteers at Paul International High School plant rows of seeds in raised beds, spring 2014. 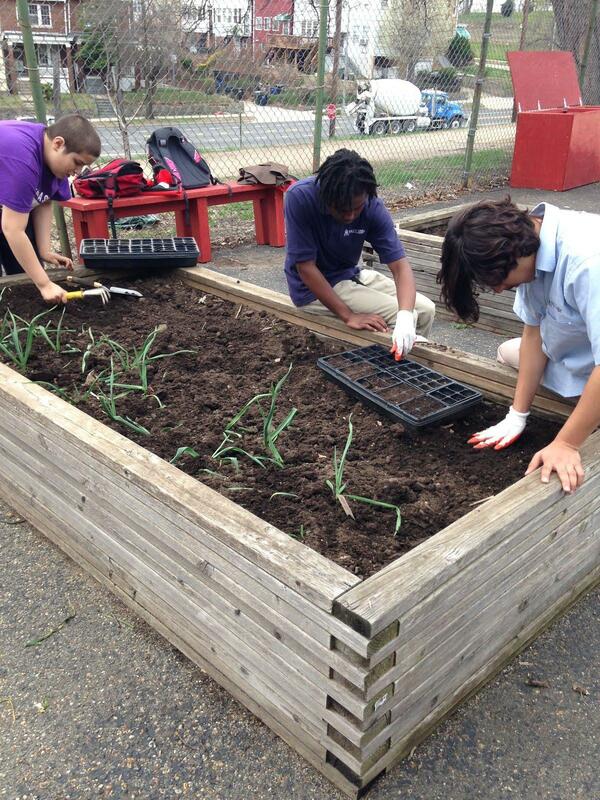 Students transplant tiny seedlings into the school garden raised beds. Spring 2014. 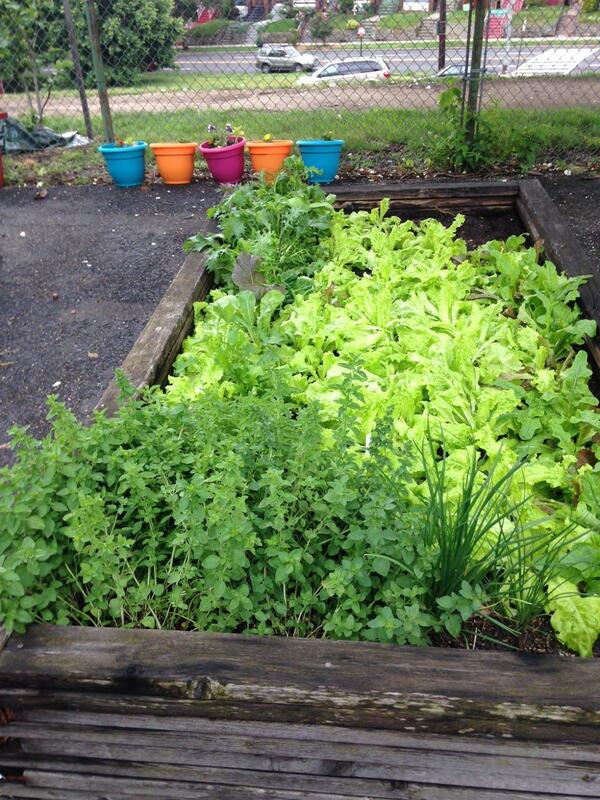 Later in the spring the raised beds in the Paul International High School garden in the Brightwood neighborhood of Washington, DC are overflowing with greens and vegetables. 2014. 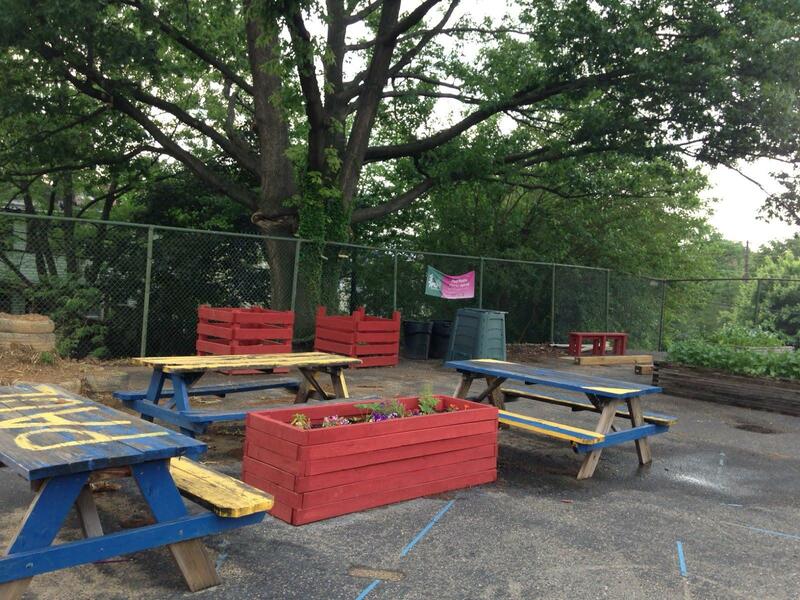 The school garden is located on a blacktop in a fenced-in area next to the school. This photograph was taken before the students repainted the picnic tables. Spring 2014.